Mesoamerica is an area of Mexico that held a large number of early civilizations before the arrival of Europeans, such as the Olmec, Teotihuacan, Maya, and Aztec. 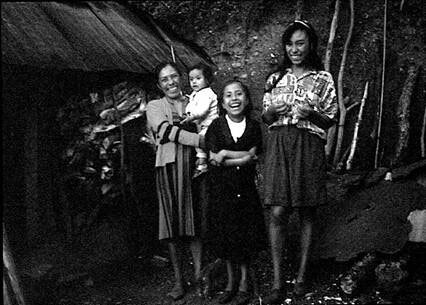 The region now holds many of Mexico's indigenous groups, who continue to speak ancestral languages despite cultural pressure to speak Spanish. 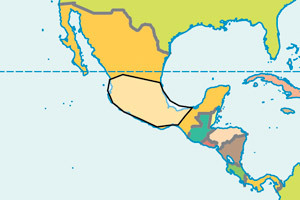 Mesoamerica is a linguistic area or Sprachbund, meaning it is an area of the world where speakers of different languages have been in contact with each other for so long that their languages have acquired traits from nearby unrelated languages. Long periods of contact and bilingualism led Mesoamerican languages to borrow many words from each other (as English has borrowed the word lava from Hawaiian and schmooze from Yiddish). Even more dramatically, no Mesoamerican languages have basic word orders that place the verb at the end of the sentence, even though languages near Mesoamerica that are related to Mesoamerican languages do have verb-final word order. This change in word order is probably a result of language contact. Campbell, Lyle, Terrence Kaufman and Thomas C. Smith-Stark. 1986. Meso-America as a Linguistic Area. Language. 62:3, pp. 530-570. Contents of site are the result of research by Gregory Anderson and K. David Harrison. © 2007.